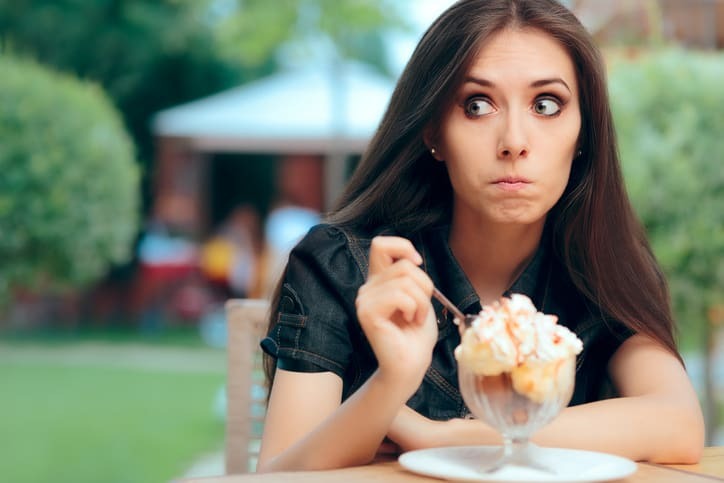 When you’re stressed it can impact your appetite and alter your food cravings. Too much stress can lead to overeating and weight gain. Fortunately, there is a way to beat this overeating pattern even if you continue to experience stress. When it comes to overeating, it’s long-term stress that causes the most damage. According to research, temporary stress shuts down your appetite. When you’re stressed your body triggers a fight-or-flight response and your body produces hormones that temporarily suppresses your need to eat. Long-term stress, on the other hand, produces hormones that increase your appetite. Stress eating drains your energy so your body seeks out additional sources of energy through food. When a person has consistently high-stress levels they are more likely to eat foods high in fat, sugar, or both. This comes as no surprise since many people store away pints of ice cream in their freezers for emergencies or dig through the free candy dish at work when they are feeling burned out. Unfortunately, these methods of relieving anxiety provide only temporary relief and can lead to weight gain. While some studies show that women are more likely to consume too much food when stressed, stress eating is a problem that anyone can face. Fortunately, a new study has found that exercise could be the perfect solution. Researchers from the University of Alabama at Birmingham studied the effects that exercise had on curbing a person’s appetite after a period of high mental work and stress. The researchers studied a group of undergraduate students after they took a test. In the study, they split the group into two. One group exercised for 15 minutes after taking their exam while the other group simply relaxed for 15 minutes. The researchers also conducted a control in which the participants simply relaxed for 35 minutes. After the 15-minute exercise and relaxation sessions, each group was given all-you-can-eat pizza. In the end, the researchers found that the exercise group consumed fewer calories than the relaxation group. In fact, the 15-minute exercise group consumed 25 calories less than they did for their control session. Meanwhile, the 15-minute relax group ate 100 calories more than they did for their control session. It’s believed that the exercise group ate fewer calories because physical activity produces glucose and lactate, which provides the brain with additional energy, and thus reduces the urge for overeating. So, if you’ve just had a stressful day at work, consider exercising to help prevent your stress eating. The study participants ran on the treadmill and you can do the same. Or, you can also try yoga, Pilates, or a brief walk around the neighborhood.